La Salle is focused on the formation of the whole person. That formation includes education, spirituality, adventure, and the desire to impact lives in the greater community and beyond. La Salle’s new Higher Education Initiative strives to create an even more supportive environment that fosters the University’s mission. 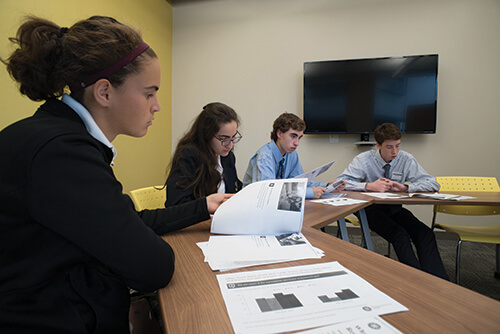 By partnering with local high schools, La Salle is not only offering students a head start on their college education, it is allowing them to explore college life and learn more about themselves along the way. 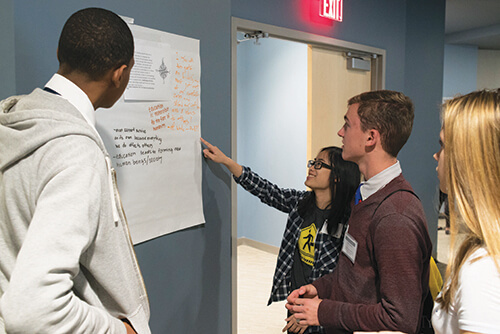 The Higher Education Initiative was created to build on La Salle’s relationships with high schools of all sorts – Archdiocesan, public, private, charter – in the Philadelphia area. The Initiative gives talented high school students a first-hand look at the Explorer educational experience. La Salle’s goal with the Initiative is not only to propel promising high school students forward on their path to success, but also groom them to become the Explorers of tomorrow. The University created a series of programs that allow students to learn what it’s actually like to be an Explorer. Keeping the University’s strategic plan, Momentum 2022, in mind, the Initiative directly helps to establish a framework of partnerships and pathways to support recruitment and the granting of dual credits. Academic Immersion programs are a day-long opportunity for interested and qualified students to engage in a college-style academic experience. The Fall Immersion is open to eight high school juniors and seniors while the Spring Immersion welcomes community college students. No matter the semester, each program offers students the choice between two academic experiences – both taught by La Salle full-time faculty. The topics include Intro to Creative Writing, Intro to Criminal Justice, and Business Perspectives. These Immersions come at absolutely no cost to the student. Dual-credit programs are not unheard of in the Philadelphia area. But, it is La Salle’s dedication to making the experience affordable and giving students access to a college campus and college faculty that sets us apart. In addition, many of the seats in the program are reserved for first-generation college students, and are offered free of charge, creating opportunities for students who are adept in the classroom but may not have the resources needed to get there.